Iceland has quiet beauty not found anywhere else in the world. I have been to Iceland a few times but can not say I know her well yet, she is like the new friend who you want to hang out more with, but who still holds a lot of mystery. My visits to Iceland have been short so far. 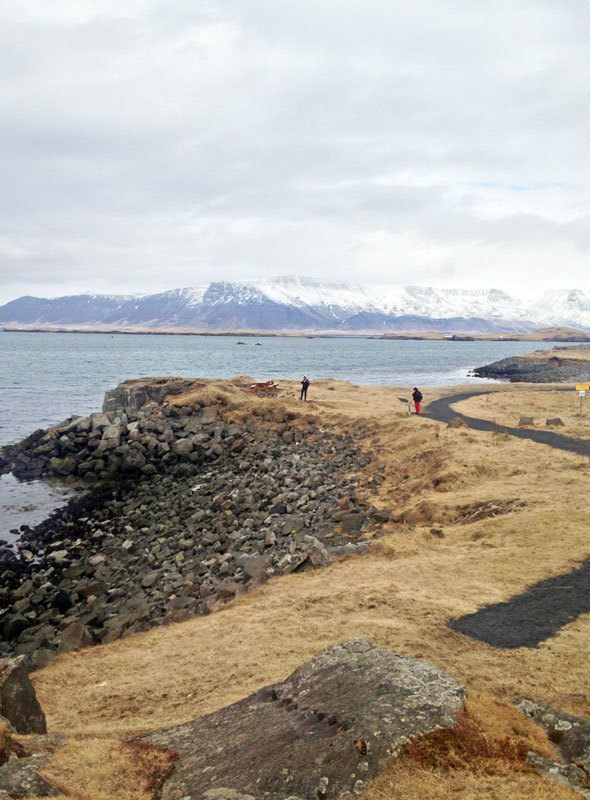 Iceland is the perfect stopover place between North America and Europe to help with jet lag and relax for a day or two. The flights to Iceland from New York or Boston are only around 5-6 hours (less than flying to California! 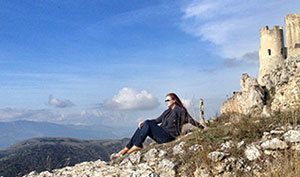 ), and Iceland is around 3 hours away from most European cities making it the perfect weekend getaway destination for Europeans or a long weekend destination for those flying from East Coast USA, or as a stopover place on your cross-Atlantic flights. I admit, Iceland is probably at its best when you take advantage of the numerous outdoor activity possibilities, like the horseback riding, mountain biking, kayaking and hiking. The island also has geysers, glaciers, waterfalls, old lava fields and caves in the mountains for adventurers. My biggest adventures in Iceland have been swimming outside in 32F weather and trying whale meat in a tapas bar. Like said, Iceland is great for various adventures and they all don’t have to include adventure sports. This may sound crazy but I almost recommend splitting your trip between two hotels, even if it’s a short stay. 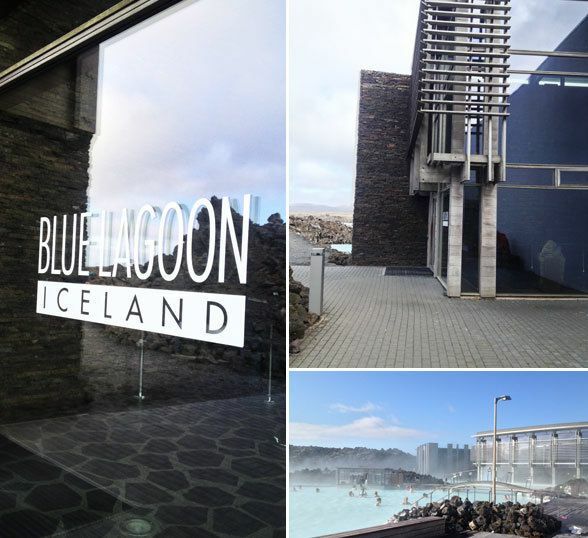 Blue Lagoon Clinic is right next to the Blue Lagoon geothermal spa, and the hotel price includes the day at the spa. The Blue Lagoon Clinic is a clinic for various skin conditions, but it is unlike any other clinic you’ve ever visited. Modern architecture surrounded by hundreds of years old lava field covered in moss gives an unique surrounding. The rooms are minimalistic with wooden floors and large glass wall with the view to surrounding nature. In addition to the stay at the spa also private lagoon and breakfast buffet are included in the price. The room price varies from $200-300 depending the season and it actually is a great deal. Blue Lagoon is close to Keflavik airport making it easy to get to, and you can take a shuttle from airport and from downtown Reykjavik. You will save time for relaxing when staying at the Blue Lagoon Clinic. There is no restaurant for dinner at the Clinic, and I highly recommend spending the day at the Blue Lagoon and eating dinner at the LAVA restaurant there. 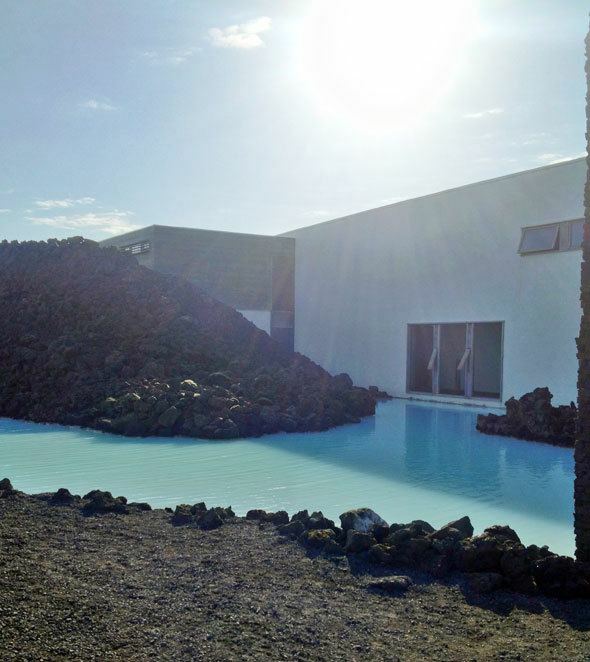 The Blue Lagoon spa is only a 10 minute walk away from the Clinic and the walk itself is pretty magical through the old lava field. (During winter time be prepared that it is a cold and dark walk, bring warm clothes and a flashlight.) You really will get the full experience when you stay at the Blue Lagoon and its Clinic for full 24 hours. 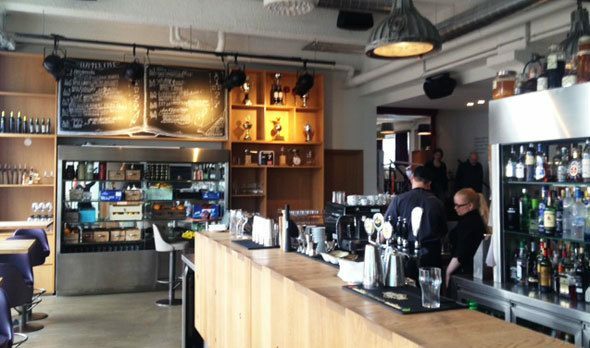 Icelandair Hotels Reykjavik Marina is probably one of my all time favorite family-friendly hotels, and yet it is a popular hot spot for cocktails and dinner for locals and travelers alike. 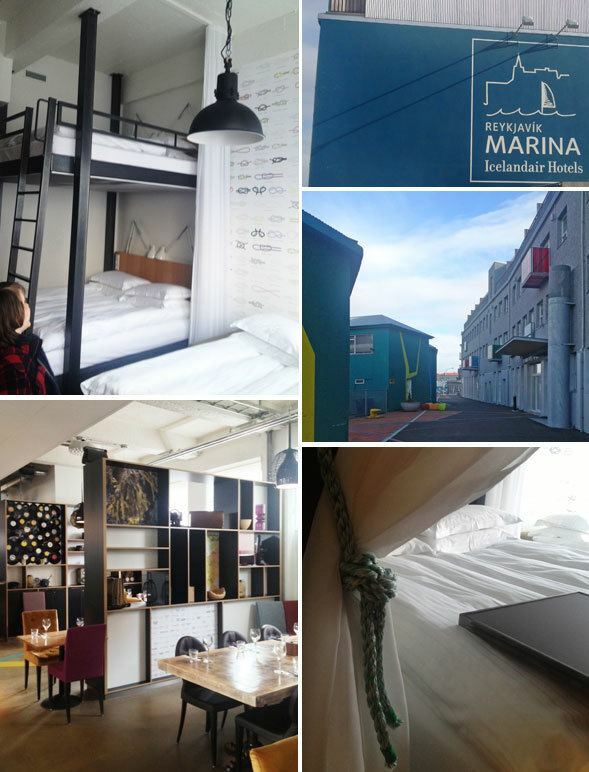 The Icelandair Reykjavik Marina Hotel is located right at the Reykjavik harbor making it very easy to walk to whale watching cruises, and to the other tour boats in the marina. It is also only two short blocks from downtown area where you can find restaurants, shops and museums. Easy walk even with the kids or great location for those who want to get out for the night in the city. The restaurant and the bar at the hotel are very popular, but we actually didn’t eat dinner there. The breakfast buffet was one of the best breakfast buffets I’ve ever seen, especially with their healthier food options, like beetroot juice, Icelandic yoghurt called skyr, fruits and two types of gravlax. Of course you can still find your eggs and bacon, fresh breads, pastries and cold meat and cheese selections as well. The location and the food were perfect, yet the room was my favorite! 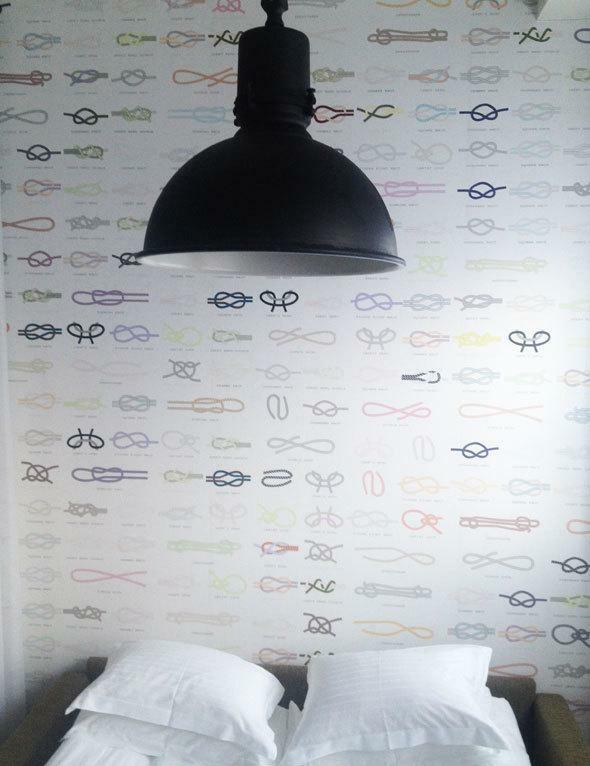 We stayed in the Studio 6 room – a room with an enormous loft bed and a foldout couch. Plenty of space for our entire family of 5 to sleep. The modern loft style decor was mixed with the seaside decor, perfect for the marina location. 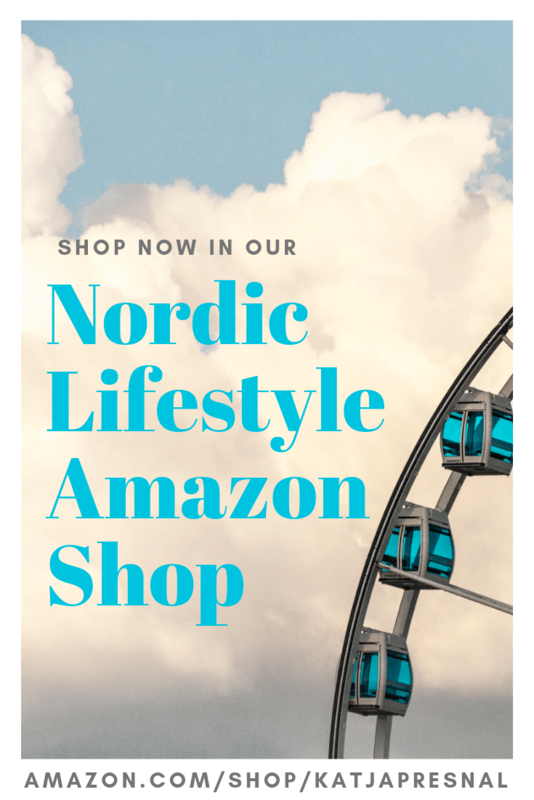 Many major airlines fly to Iceland, but to stay on budget I recommend or my American friends to check out Icelandair Economy class, and for my European friends I recommend checking out WowAir. WowAir only flies within Europe, but IcelandAir is a great inexpensive choice for flying between Europe and USA and offers a free stopover in Reykjavik if you are on your way to/from Europe. I don’t recommend the Saga Class/1st class on Icelandair, but the price/quality for Economy class is perfect. Flights from New York start from around $600 with Icelandair, and flights from London start at £69 one way with Wow. 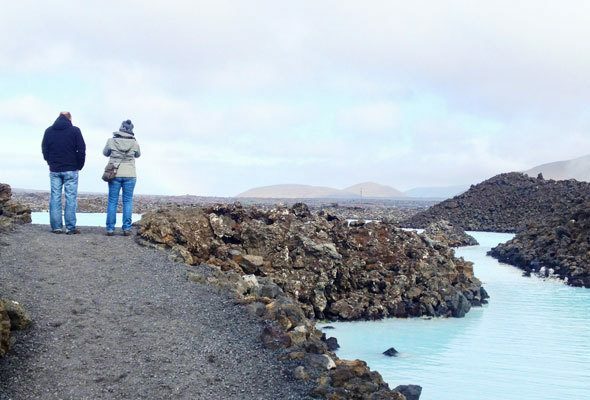 I also recommend checking out WowAir’s Blue Lagoon package from London with two days in Iceland starting from £154. Stay tuned for my must do things in Iceland post, and check out Tiny Iceland and Visit Iceland for more info. So neat. Blue Lagoon was beautiful. I love this. I’d love for our company to take a trip there this winter for our annual meeting! What was whale meat like? After seeing these photos and reading about Iceland, I have to put Iceland on the “Must Go” list I keep. I love the rugged natural beauty.